The Galaxy Far, Far Away has never been closer. Star Wars: Galaxy’s Edge, the massive 14-acre land coming to Disneyland and Disney’s Hollywood Studios, now has an official opening date. SWGE will open slightly earlier than expected at Disneyland on May 31st, and much earlier than expected at Walt Disney World on August 29th. That is big and exciting news, but there’s much more to it than that, young Padawan. Here are the details you need to know about the Star Wars: Galaxy’s Edge opening on both coasts. Until June 23, Disneyland requires a no-cost reservation to get into the land. On the announcement trailer, Disney notes that capacity is limited on both versions of Galaxy’s Edge. Since Disneyland is the first to open, they will be trying to manage the onslaught of fans by requiring a reservation to get in. Not much more is known about these reservations, except for the fact that they will surprisingly not cost anything. It seems like Disney is trying to avoid the situation that accompanied Pandora’s opening, where there was a massive wait just to get into the land. As of right now, there are no announced plans for Disney World to require reservations. Depending on how Disneyland’s debut goes, those plans could change. Absolutely desperate to get in to Black Spire Outpost in the first month? Disney did announce that if you’re staying at a Disney hotel in Anaheim (Disneyland Hotel, Paradise Pier Hotel, or the Grand Californian), you will be guaranteed one reservation per guest. Staying at the hotel is your best bet right now. Been dreaming of flying the fastest hunk of junk in the Galaxy since you first saw it in Docking Bay 94? Me too. We’re in luck, as Millennium Falcon: Smuggler’s Run will be fully operational come opening day. That’s the good news. The bad news? It will be the only major attraction open. Galaxy’s Edge is opening in phases, meaning Star Wars: Rise of the Resistance will come online “later in the year.” We’ll have to wait a little longer to experience the most ambitious attraction Disney has ever created. There will be no FastPass – at first. Smuggler’s Run will not feature a FastPass line when the land opens. This seems to be a temporary step to avoid the most astronomical wait times this side of Tatooine, but there’s no clue as to when FastPass will be added. There will be a Single Rider line, and there’s no indication that this line will be delayed like FastPass (sidenote: it would really surprise me if they didn’t have Single Rider open on the first day, as this will add to the efficiency of the line and add to the ride’s hourly capacity). If you’re staying at a Disney World or Good Neighbor resort, you’ll have access to Extra Magic Hours, where the park is open an hour earlier or 2 hours later on specific dates. Disney announced that they plan to keep Galaxy’s Edge open during EMH, which is great news for WDW resort guests. Both Rise of the Resistance and Smuggler’s Run have height requirements. Sorry Yoda. 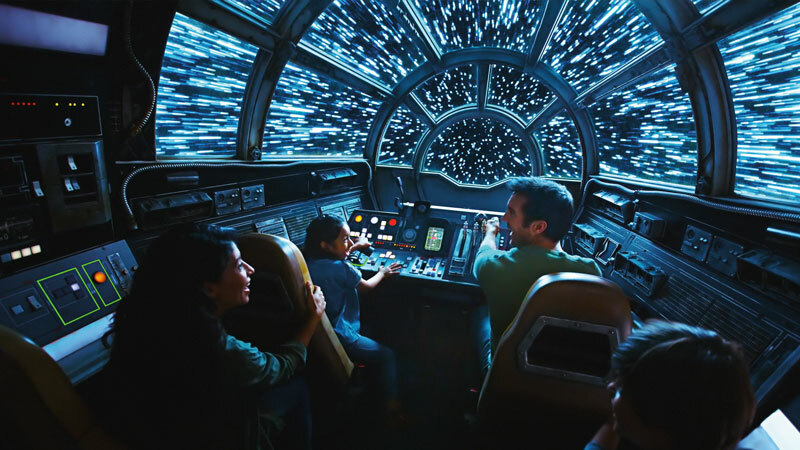 Millennium Falcon: Smuggler’s Run will have a 38″ heigh requirement, while Rise of the Resistance will have a 40″ height requirement when it opens. See that photo at the top, where there’s maybe 10 people around the Millennium Falcon. It’s cute. It’s also extremely unrealistic, as we know that Galaxy’s Edge is expected to bring in record crowds in Anaheim and Orlando. Especially for the first year that this is open, buckle in for long lines and big crowds.